They have found the obvious gap in the market for a proper pub but someone running the place seems to have an aversion to a proper bitter. Plenty of goldens, pales, stouts and ciders but no classic bitter. As commented on you do need to get in early - especially if you want a table to scoff your pork roll (very nice it was too). 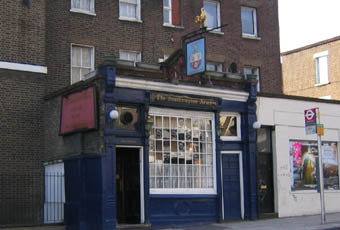 Good as it is the fact people are extolling how great a pub this is appears as more of an indictment on how poor London's pubs have become and particularly the NW postal districts with barely nothing of note outside NW1 and NW5. 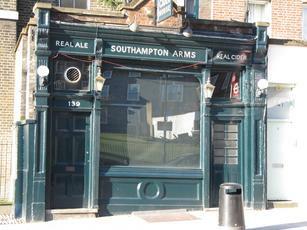 My most recent visit to the Southampton Arms was in mid-January. Very little has changed. It's still a vibrant pub sticking to its principles. Ales on this visit were Thornbridge Lord Marples, Kent Cobnut, Dark Star Revelation, Howling Hops AUPA, Summer Wine Stateside, Teleporter & Redwood, Gyle 59 Freedom Hiker, East London Orchid & Magic Rock Dark Arts. Ciders were Crone's Organic, Millwhites Hedgelayer, Perry, Ginger Gold & Blackberry Blush, Farmer Jim's Farmyard Fruits & Snail's Bank Very Perry. Fatty's Scrumpy & Orchard Pig Navel Gazer came on later. So did Brodie's Shoreditch Sunshine. Still my favourite pub. If I had one criticism, it would be with the ciders. There is too much of an emphasis towards Millwhiltes ciders, which aren't a particular favourite of mine. But maybe others do prefer them. An excellent, well-maintained pub of the bare floorboards and a log fire variety, although the room was a bit cool for me. Warm welcome from the barmaid and a great pint of Gun Brewery pale ale. You get your beer or cider in a pint or half-pint handled mugs here. They play vinyl LPs for the background music. Clean toilets, the gentlemen's outside via the garden. Quite busy on this Saturday lunch-time with a mostly younger aged clientele. We wish to return. Over a year on from my last visit, I'm still rating the Southampton Arms as the best pub in London. It still has the same amount of ales and ciders. The ales are continually changing. On entry, they had Dark Star Partridge, Revelation & Espresso, Gyle 59 The Rye Saisonnier, Marble Lagonda IPA, Magic Rock Ringmaster, Gipsy Hill Beatnik, Triple fff Pressed Rat and Warthog, Dark Arts Stout & Howling Hops Ruby Red. By the time we'd left, Howling Hops Amber Dexter & Running Beer, Harbour IPA & Burning Sky Aurora had all been pulled through instead of 4 of the original options. I hadn't noticed it before, but there is a small cabinet by the entrance door with the pumpclips for forthcoming ales. Ciders and perries were Cider Bus, Burrow Hill Farmhouse, Olivers Making Hay, Newton Court Gasping Goose, Grenadier Medium (possibly Millwhites), Fosseway Somerset Glory, Millwhites Rum Cask & Sandford Orchard's Fanny's Bramble. The food is typical pub snacks such as Scotch Eggs and sausage rolls. Along with the pork joint for sandwiches, it always looks tempting. But the prices are less so. My only problems with the place are that it is generally packed (you're best advised to get here at opening time when you can enjoy the pub and get a table) and it feels a little too trendy to be a decent alehouse. Nevertheless, it still scores a solid 9/10 from me.